The world as he knows it is crumbling around him. Marc Bravo has just seen the twin towers in New York City fall and terrorism is on the minds of every American and dominates conversations across the globe. September 11, 2001 marks the beginning of a string of events that will change Marc’s life in a way he could never have predicted. When his parents go missing from their volunteer work with Doctors Without Borders, Marc drops everything to find them and bring them home safely. What Marc can never predict is what he will learn about their kidnappers, their true intentions, and how the entire world may ultimately be affected. Alice Sandoval’s The New Holy Warriors is a timely piece detailing the events following the September 11th attack on the United States. Sandoval takes the story beyond the accounts that we have all seen and heard and breaks down the symbolism of the event itself. In addition, the author lays out for readers a story like no other as she follows Marc Bravo on a quest to find his missing parents who are assumed to have been kidnapped. Marc’s story and his journey for answers is based on true events and is stunning in every way. One of the most striking elements included in Sandoval’s work is the way in which Islamophobia is addressed. In a very straightforward manner, the author reminds us all of the horrific treatment of anyone appearing to be of Middle Eastern descent. Via her main character, Marc, she drives home the fact that stereotyping immediately following September 11th was rampant and a danger to countless numbers of innocent people. Another aspect of Sandoval’s story, which might go unnoticed by many, is the description she gives of the strange incidents in the skies above Mexico. Marc is treated to an elaborate explanation of the event and is informed that UFO sightings above Mexico are fairly commonplace. As this book reads as primarily nonfiction, it is almost chilling to listen in on the characters’ conversation about these “cigar-shaped” ships. As an added bonus to the already curious events, Sandoval includes the story of a suspected relationship between the Mayans, the pyramids, and Martians. The casual conversation included in this story inspired by real events is not in the least out of place, but it is truly fascinating. Sandoval does not shy away from sharing the abject horror involved in terrorism and the groups involved. With color photographs and blatant captions, Sandoval openly shows readers the brutality carried out by organizations like Al Qaeda. If there was ever any doubt in the reader’s mind about the capabilities and intentions of terrorist organizations, Sandoval wipes it completely away with one swift stroke of the pen. 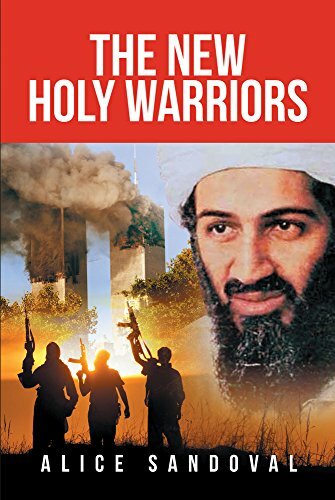 The New Holy Warriors is a fascinating and eye-opening account of terrorism as viewed through the lives of ordinary citizens. Marc, his brother, and best friend are the vessels by which Sandoval delivers an amazing story readers will wish was just that–simply a story.